Finally LIC joins the online insurance club of India. Yes LIC is back with Online Term Plan e-Term. LIC e-Term is online term plan which provides financial protection to the insured’s family in case of his/her unfortunate demise. Let’s review e-Term. This plan is available through online mode only and no intermediaries will be involved. Two different categories are available under this plan. Death Benefit:- In case of unfortunate death of the Life Assured during the policy term Sum Assured shall be payable. Maturity Benefit:- On survival to the end of the policy term, nothing shall be payable. The Yearly premium for LIC online term plan for 50 lacs sum assured is Rs 8,202 (for 30 yrs old male and for 30 yrs term) In below chart I tried to compare LIC’s online plan with other online term plan available in market. Interestingly compare to other private insurance term plan LIC e-Term plan is costlier. Age 30 years Term 30 Years, Risk cover 50 Lacs. Should I buy this Policy? If you look at only cost LIC e-Term is costly affair. We have better other online term plan in market like SBI life e-shield or HDFC click 2 Protect. Compare to existing offline term plans of LIC – Jeevan Amulya 2 this plan looks cheaper. LIC offers highest claim settlement ratio last year LIC claim settlement ratio was 97.3%. 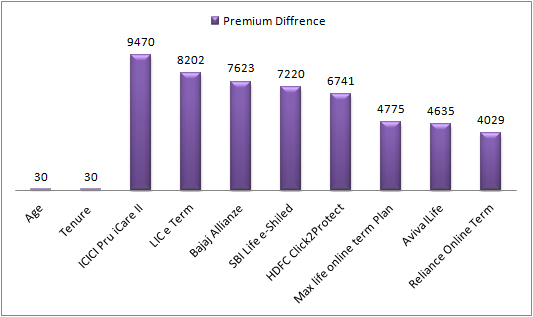 Claim settlement ratio of private insurance companies like HDFC, SBI, ICICI is around 90%. So from claim settlement point of view e-Term is better. If you have not purchased any term plan and you have apprehension in purchasing term plan from private insurance company LIC e-Term is for you. Maximum age is up to 75 Yrs. We have no experience about service level of LIC in terms of Online term plan. Are you buying the LIC e-Term ? How did you find this review ?